Plugiator, Hardware Plug-in Host from Use Audio Inc..
At the NAMM show Use Audio Inc. is launching their new Plugiator tabletop synthesizer which utilizes modular proprietary plug-in technology to run various different synthesis models in a convenient compact hardware form factor. The Plugiator can hold up to eight different synthesis plug-ins and run any one of them at a time. Additionally, the Vocodizer, a feature-rich vocoder, can be downloaded as a registration bonus at no cost. Four more plug-ins are optionally available and can be upgraded at a later time: the Prodyssey (Arp Odyssey), the Pro-12 (Prophet 5), the FMagia (an innovative FM based synthesizer) and the Drums’n’Bass (an electronic drum kit combined with a bass synth). The hardware can store and recall up to 100 presets per plug-in. Typical polyphony is 10 to 12 voices. Next to selection of plug-in and preset, the Plugiator features eight knobs for control of important sound parameters and ten keys which serve to quickly call up stored plug-in/preset combinations. 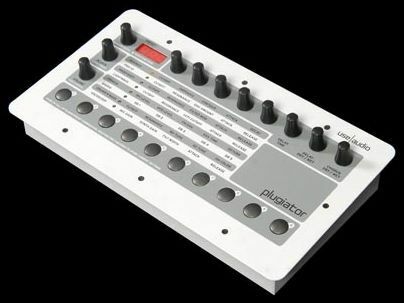 The Plugiator can also be controlled from a keyboard or a sequencer using MIDI program change and controller change commands. Connections include USB, a microphone input for the vocoder and a headphone output. For sound design and management of presets, the product is shipping with a software which lets the user edit the sounds via a familiar plug-in graphical user interface when connected to a computer via USB. The software also features integrated online functionality and access to a central sound server – users can listen to new, user-uploaded sounds from the internet with just one mouse click. The software runs under Windows at release time and is announced to become available also for Mac OSX by March 2008. The Plugiator is scheduled for shipment in February and is priced at 469 USD net (399 EUR inc. VAT). Sonar 7.0.2 The SONAR 7.0.2 update adds new Step Sequencer functionality and usability enhancements, along with numerous plug-in and component optimizations. Synths of the 70s for Kontakt Sounds and Effects presents a new sample library : Synths of the 70s for Kontakt. DSK Music presents 3 new freewares DSK offers 3 new free plug-ins : Mini DrumZ, Odisea and ThoR.